A Palladian house is one inspired by Andrea Palladio (1508-1580), an Italian mason turned architect who made a career out of building Villas for Venetian-based landowners. His study of ancient buildings in Rome helped him to develop personal theories of architecture. He shared these theories, along with plans and drawings of his villas, in his book The Four Books on Architecture or I Quattro Libri dell'Architettura (1570). In his book he has woodcut plan and elevation drawings for villas he designed, drawings for important temples from antiquity, and lays out sets of rules covering nine areas: walls, doors, ceilings, stairs, columns, windows, frames, roof and details. The rules cover both construction and design. The latter dealt with geometry, style and proportion. His book was composed as four books but bound as one, thus the name. His book gave his style legs. Over the course of decades and centuries Palladian houses would pop up throughout Europe, England and Ireland. The architect Inigo Jones (1573-1652) was the first major English designer to borrow from Palladio. Politics got in the way and after Charles I was beheaded the Palladian style fell out of favor. It was revived in the early 18th Century by the printing of a translation of the Four Books and by two books that published the designs of Inigo Jones and other Palladian architects.Vitruvius Britannicus (1715) by Colen Campbell, a four volume set, was the most popular, and showed elevation drawings of classical building thoughout Britain. Following that success William Kent published The Designs Of Inigo Jones: Consisting Of Plans And Elevations For Publick And Private Buildings in 1727. Two years later George Berkeley added to his Rhode Island farmhouse Whitehall a doorway fashioned after an Inigo Jones drawing in The Designs of Inigo Jones. It was a humble start for the influence of Palladio in America. His influence was felt in a grander scale in the Southern colonies. 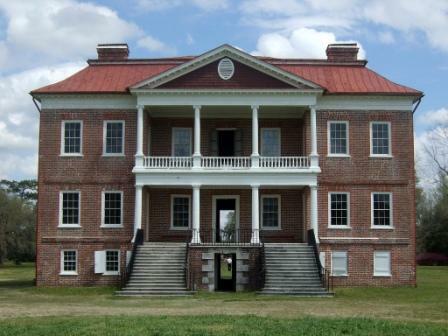 Southern plantation owners began adapting his designs to their needs. Thomas Jefferson is his most famous disciple in the United States. The original design for his house, Monticello, was based on a Palladio design. 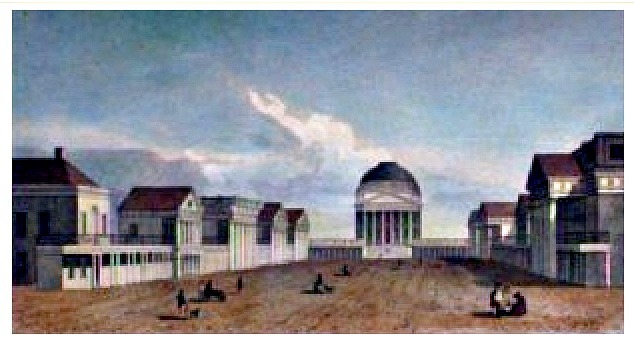 Over time the central house was drastically altered into its own unique interpretation of classicism, but the estate as a whole retained the Palladio layout of buildings. 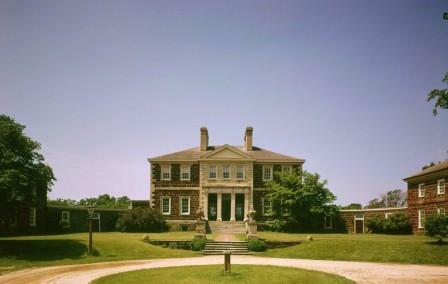 George Washington also adapted the Palladio layout for Mount Vernon. What is this layout? Palladio designed grand houses for rural Italian estates, not unlike a Southern plantation. An estate, a farm as it were, needed some outbuildings, for storing supplies, workshops or for living quarters for farm workers. 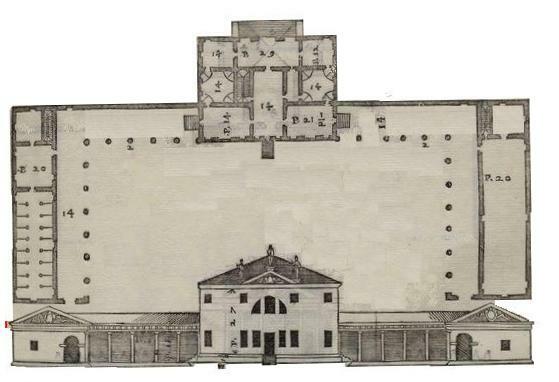 Palladio would situate two dependent buildings on either side of the main house, at an equal distance. These two buildings would then be connected to the main house with a colonnaded walkway, or a long, low building. 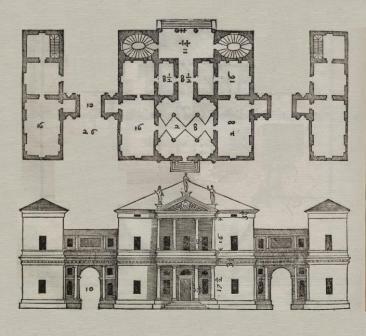 It was this five-part layout that is, perhaps, the most original of Palladio’s ideas, and the feature that most readily marks a Palladian house. Even in the case of a house like Mount Vernon, which does not look like a Palladian house, you can at least say that site plan follows Palladio. This layout is found in the second of his books, the book dealing with villas of his own design. 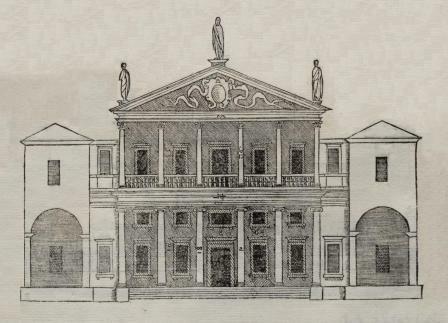 In the illustration below Palladio has shown a plan drawing imposed on top of the elevation drawing. In this you can see the that two out buildings are the same height as the colonnade. In this case the building are forward of the main house. The colonnade joins the out buildings on the same line as the house, but the colonnade continues as a covered porch on the out buildings so the whole scene is if you have three sides of a rectangle enclosed by the buildings and colonnade. In other drawings the colonnade curves out to join the out building so that a flattened semi-circle is formed. I have also included another drawing that shows the same five-part design, but where the colonnades have been replaced with a connecting building. In some cases, especially with English Palladianism, this connecting portion grew to be the same height as the main structure and all five parts meld into a single building with five sections. In this second drawing from The Four Books the colonnade is replaced with a raised hallway. Thomas Jefferson used this idea at Monticello, but also again at the University of Virginia, where his Rotunda took the place of the main house, and a series of minor houses and student rooms took the place of the out buildings. All this was on a lawn gently sloping away from the Rotunda and toward a view of the distant Blue Ridge Mountains. Each of the minor houses was itself an architectural study showing different styles of classical design. This early artist's rendering of the lawn at the Univerity of Virginia's Academic Village shows the colonnades forming a lane of supporting buildings. Palladian houses that appear in his book all had some kind of front porch. In the earlier houses this is a loggia, a porch indented into the main structure. In later houses he borrowed the grand porches that fronted temples and placed them at the service of his houses. This latter innovation has been copied by a host of classical inspired houses that might otherwise have nothing in common with Palladian house design. Not content with putting a temple porch on a house he played around with the design and made it a two-tiered porch. This was not something found in buildings of antiquity, but his own doing. It can look awkward depending on the setting and proportions, but it gives a second story balcony and improves the porch by giving it a lower ceiling. A roof that is 20 feet over your head is not going to keep out much rain, or sun. One that is 10 feet will do a much better job shielding you. This third drawing from The Four Books shows the two-tiered porch. In a Palladian house the layout of rooms is symmetrical about an axis running from the front to the back. This is common to most neoclassical houses. He further designed his rooms to have certain proportions. While some were square, many rectangular rooms were build around the proportions of six and 10. These two numbers are supposed to define the proportions of the human body, and are therefore supposed to be proportions that are most pleasing to people. Thus, in Palladian theory, a room that is 12 feet by 20 feet is more pleasing than one that is 11 feet by 20 feet. The measurements are not critical, since that will differ based on the units used. It is the ratio of width to length (and presumably height) that is critical. This adherence to certain proportions for the footprint of the room is one principle most of his adherents ignored when designing Palladian houses. Palladio had another philosophy that was perhaps adhered to more truly in America than in Europe. Palladio’s houses were built on the cheap. The Venetian elite had their palaces of marble and stone in Venice. Their country estates were built with brick and wood and plaster. The walls were brick covered in stucco. The pediments were wood with plaster sculptures decorating the pediment and frieze. The columns, not having to support heavy marble, were also wood. The Southern planter class had wood in abundance, and plenty of clay from which to make brick. Their Palladian houses were true to his construction techniques, whereas the English Lords tended to build in stone. I remember a field trip to Richmond while I was a young student in Virginia. We took a tour of the statehouse, and I remember the tour guide explaining how the columns only looked like marble. They were actually made of brick, and then plastered over. Palladio would have approved. There is a class of architects who follow the advice of John Ruskin (1819-1900) who felt that design had to be honest and true to the materials. It is also fair to say that there is a counterclass of architects who say that this is a bunch of hooey. Palladio would fit comfortably in the latter. Mount Airy, an estate in Virigina, shows curving colonnades.